Tucked away in the Papers of the Mellish Family of Hodstock, Nottinghamshire, in the University of Nottingham’s Rare Books and Manuscripts collections, Lady Mellish’s “Old Accts dinners & c. 1706” sits rather unobtrusively among generations of Mellish family correspondence, account books, and estate ledgers. Although the 17th century featured a shift in what were traditionally women’s professions such as beer-brewing and midwifery to the purview of men, it still fell to the lady of an upper-middling home to coordinate the activities of her household members, manage the procurement and preparation of provisions, and arrange the entertainment of guests. Judging from Lady Mellish’s notes, the Mellish family entertained at least twice monthly. Particularly distinguished guests were cause for elaborate culinary preparations: for the visit of the “Duke of Leads” on the 12 September 1705, for example, she made “stued pidging, pees, goose, egge pyes, hanch of venison, revived Jupe tongue & chikins, whit frigeee, collered eale hot / Ducks & Partriges Peas, Damson Tart, Tansey Tueky, scollops” among other dishes! But the Mellishes most frequent visitors seem to have been gentry neighbor families – the Huetts, Garves, and Cliftons. Historians of Tudor England have noted a late-16th century decline of the manor house as a place where the lord and his laborers could commune directly and do business; the gentry’s greater desire for privacy and separation from the laboring sorts meant architectural changes in the great manor homes: more private spaces for the family and greater distance between the servant’s and the family’s living quarters. Lady Mellish’s account books contain floor plans of the family’s home as well as sketches of what appear to be table seating arrangements for dinner parties, indicating what appears to be Lady Mellish’s keen interest to use the resources at her disposal to strike just the right tone for social gatherings. 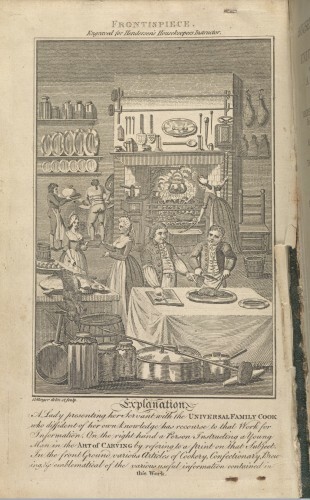 Frontispiece showing a domestic kitchen scene, from The housekeeper’s instructor; or, universal family cook / Being an ample and clear display of the art of cookery in all its various branches..by William Augustus Henderson. Published ca. 1790. Henderson’s success in this genre to some degree resonates with a larger early modern trend of men becoming experts in fields which were previously dominated by women, such Hannah Woolley’s renown for housekeeping advice a century prior. Image Credit: Wellcome Library, London. Not only did Lady Mellish take notes on her gastronomic exploits, but she also kept a detailed account of all her expenses, as well as making alphabetical lists of words, seemingly at random. Also Included is an “Account of my Jewells March the 9th 1707.” In short, Lady Mellish’s papers would make for an interesting study on the role of gentry women in culinary history and in the changing social landscape of early modern England. University of Nottingham Rare Books and Manuscripts, Me 2E/1/1, Old Accts dinners & c. 1706. See also the National Archives’ Discovery entry on the Mellishes (accessed 4 July 2015). On the phenomenon of brewing and midwifery gradually becoming men’s professions, see Judith M. Bennet, Ale, Beer, and Brewsters in England: Women’s Work in a Changing World, 1300-1600 (New York and Oxford: Oxford University Press, 1996), and Michelle Dowd, Women’s World in early modern English Literature and Culture (New York: Palgrave Macmillan, 2009). For examples of scholarship on the transformation of early modern English domestic space, see Roger Chartier (ed), A History of Private Life: Passions of the Renaissance (volume III), Cambridge, Mass. : Belknap Press of Harvard University Press, 1989; Felicity Heal, Hospitality in Early Modern England (New York and Oxford: Oxford University Press, 1993); Amanda Vickery, “An Englishman’s Home Is His Castle? Thresholds, Boundaries and Privacies in the Eighteenth-Century London House,” Past and Present No. 199 (May, 2008), pp. 147-173. By the turn of the century, Wolley’s publications had secured her international reputation as a household management expert. See “Wolley, Hannah (b. 1622?, d. in or after 1674),” John Considine in Oxford Dictionary of National Biography, see online ed., ed. Lawrence Goldman, Oxford: OUP, 2004 (accessed July 9, 2015). University of Nottingham Rare Books and Manuscripts, Me 2E/1/1, Old Accts dinners & c. 1706. Hannah, Woolley, The Accomplish’d lady’s delight in preserving, physick, beautifying, and cookery containing I. the art of preserving and candying fruits & flowers …, II. the physical cabinet, or, excellent receipts in physick and chirurgery : together with some rare beautifying waters, to adorn and add loveliness to the face and body : and also some new and excellent secrets and experiments in the art of angling, 3. the compleat cooks guide, or, directions for dressing all sorts of flesh, fowl, and fish, both in the English and French mode… (London: 1675), 297. In the ODNB entry on Hannah Woolley, John Considine maintains that this work was not actually written by Woolley; rather, it was one of several copy-cat publications design to replicate the success of her work. Early English Books online, however, attributes the work to Woolley.